There are many ways a writer could collaborate with readers, other writers, illustrators, and more. Friends and fans can form a writer’s launch team for a new book. Other authors who write in the same genre can form promo teams to blog or release book sets. Those who write books for children are especially likely to team up with illustrators. When the February theme for the Blood-Red Pencil turned out to be Partnerships, however, one collaborative effort popped into my brain from right here in Northern Colorado. 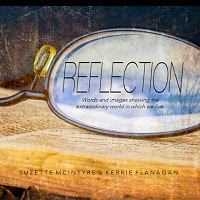 Author, writing consultant, and publisher Kerrie Flanagan teamed up with artist and photographer Suzette McIntyre to create and publish three coffee table books. The project seemed a huge undertaking to me, so I contacted Kerrie and Suzette to see if they would share a few of their experiences. I started with Kerrie, asking her how the idea for these projects originated. Suzette expanded on the class and workshops she and Kerrie presented, then added, “The first book was originally going to be just Kerrie and me, but I was getting ready to hold an art competition at the gallery, and after a bit of discussion we added a poetry category to the competition and decided to add the winners to the book. Doing this would create more awareness and interest." At that point, I was curious about what came first during the creative process, the words or the images. I asked Suzette that question plus one about their brainstorming process. 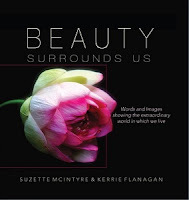 For Kerrie’s contributions, she sent her photographs to Suzette for book layout, then Suzette inserted Kerrie's text on the opposite blank page when she received Kerrie’s poems. Most of the work was done through email, but the two met a few times to talk about marketing. There’s a business side to think about when collaborating with another person on a project, so I asked Kerrie what her best advice would be on the value or necessity of a written contract for these projects. 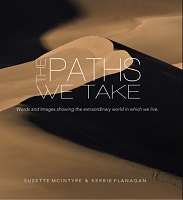 When I think of the one collaborative writing project I worked on many years ago with my brother, I’m impressed that Kerrie and Suzette produced three of these amazing books. My brother and I vowed not to write together again after just one try. 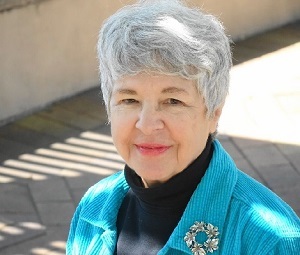 Here is Part Two of this article, including bios for Kerrie Flanagan and Suzette McIntyre. I love the idea of marrying photography and poetry. While each can be powerful on its own, the synergy created by partnering them takes that power to new heights. Contracts should always be a integral part of partnership arrangements because, as you note, it keeps friends friendly. This is a great post, Pat. So glad you are with us again! We've missed you. I feel like I would work together with someone as smoothly as you, Patricia. But those two ladies seem to have found a perfect project. I think it takes a special type of personality, Susan, and as Linda confirmed in the above comment, a good contract. I enjoyed putting together images for a handmade chapbook of my poems. The two mediums are powerful when used together. A book of photos put together with quotes from historical figures would be interesting. And I also like drawings with essays or short stories. Maybe I'm a kid at heart because for me, pictures always make a story better. I enjoy these kinds of books, so thanks for introducing me to these two. I think that "marrying" two forms of creativity can always be a good thing, especially when the two artists have as much respect for each other as Kerrie and Suzette seem to have.